American Eagle Ammunition is a line of ammunition coming for Federal Ammunition. It often represents their more budget conscious ammo. American Eagle represents the brilliance in the basics when it comes to ammunition production. American Eagle knows it can get costly and time-consuming to buy and load all that ammunition. They want to lead a helping hand. When you purchase at least two boxes of American Eagle Varmint and Predator ammunition you’ll receive a free Butler Creek ASAP loader for AR15 magazines. The Varmint and Predator line includes most of your familiar common medium game loads. This line consists of the 223 Remington, the 22-250, and even 243 and lightweight 308 loads. They are jacketed hollow points and come in boxes of 50 and 40. The Butler Creek ASAP is a speed loader that locks on top of your AR 15 magazine. The device can load one round at a time or even ten rounds at a time with a military-style speed strip. It’ll make loading those 100 rounds of Federal American Eagle Varmint and Predator a breeze. It’s a thumb saver if you are a high volume shooter. These are my favorite kinds of rebates; they are more or less affordable for everyone. It’s a small amount of ammo required to get a pretty cool free item. To snag the rebate you’ll need to fill out a short form and upload a picture of your receipt. Go to https://promotions.vistaoutdoor.com/brands/5/39 to start the process. Well, buy the ammo first and then go there. 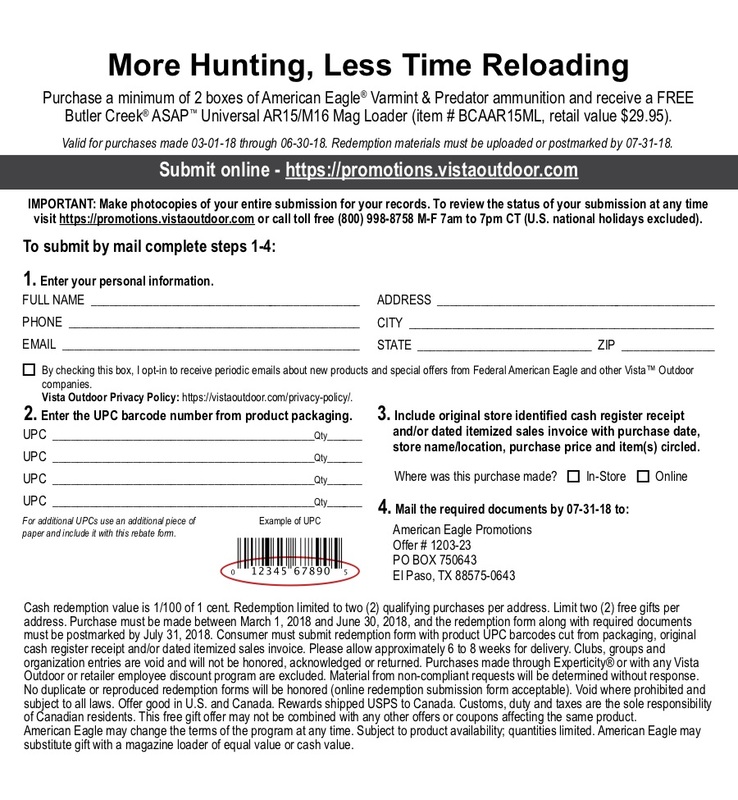 The post American Eagle More Hunting, Less Time Reloading – Free Gift Redemption – Expires 06/30/18 appeared first on Omaha Outdoors.